OPPO R17 has finally gone on sale in India starting today. This mid-range smartphone from OPPO was launched earlier this month in India, alongside its sibling R17 Pro. The latter went on sale right after launch, but the company had not revealed the launch schedule for the former till last week. The key OPPO R17 specifications include in-display fingerprint sensor, Super VOOC fast-charging, 25-megapixel selfie camera, and 8GB of RAM. The OPPO R17 price in India is Rs 34,990, which is a little on the higher side considering the specifications and the competition. 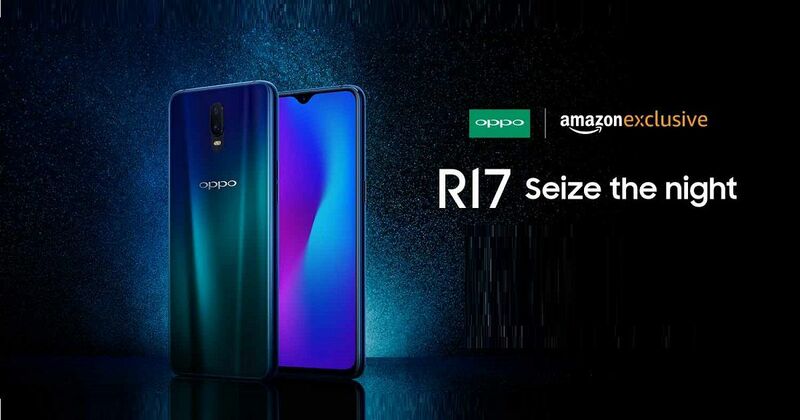 This high price was expected since OPPO launched the R17 Pro at Rs 45,990. The smartphone is exclusively available via Amazon.in in India and comes in Ambient Blue and Neon Purple colours. As part of the launch offers, OPPO R17 buyers will get instant 5 percent and 10 percent discounts on EMI transactions on payments made using HDFC Bank credit and debit cards. Jio customers will receive extra 3.2TB of data and up to Rs 4,900 worth benefits from the operator and MakeMyTrip. OPPO will also provide one-time screen replacement for Rs 990. Users who are exchanging a smartphone for the OPPO R17 will receive extra Rs. 5,000 discount. Finally, no-cost EMI options are available via Bajaj Finserv EMI card and all major credit cards. OPPO latest mid-range smartphone is a very good looking device. It features a 6.4-inch full-HD+ AMOLED screen with a waterdrop notch at the top and is protected by Gorilla Glass 6. An in-display fingerprint sensor is embedded in the display. The phone is powered by the Snapdragon 670 chipset, which is paired with 8GB of RAM and 128GB of internal storage. There is a microSD card slot with support for cards of up to 256GB capacity. The smartphone boots Android 8.1 Oreo-based ColorOS 5.2 custom skin. In the camera department, the OPPO R17 gets a dual-rear camera setup with a primary 16-megapixel f/1.7 sensor and a secondary 5-megapixel f/2.4 depth sensor. For selfies, a 25-megapixel sensor is placed inside the tiny notch. The device comes with a 3,500mAh battery with support for Super VOOC fast charging. Also included is a 3.5mm headphone jack.